But Britain, in fact, already has a serious problem with loneliness, research has found. 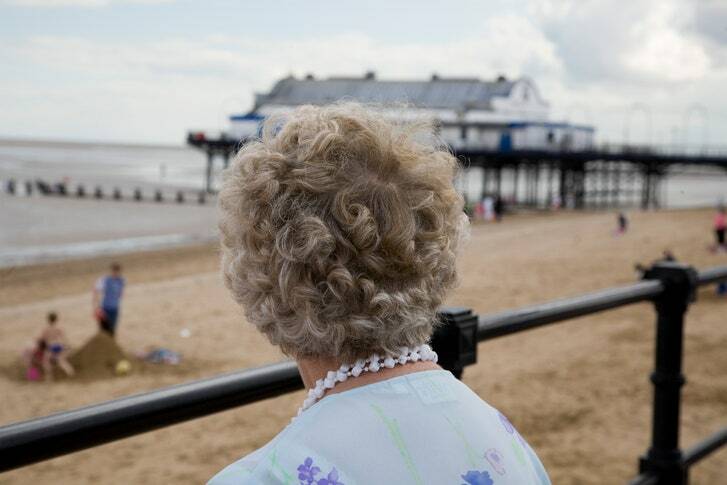 More than nine million people in the country often or always feel lonely, according to a 2017 report published by the Jo Cox Commission on Loneliness. The issue prompted Prime Minister Theresa May on Wednesday to appoint a minister for loneliness. Britain is the loneliness capital of Europe with its inhabitants less likely overall to know their neighbours or have strong friendships than people anywhere else in the EU, an official study suggests. Only the Germans are less likely than the British to feel “close” to their neighbours but they also are significantly more likely to have strong friendships on which they could rely in a crisis, the analysis published by the office for National Statistics shows. Britain is ranked 26th out of the 28 European Union countries by the proportion of the population who say they have someone on whom they feel they could rely if they have a serious problem. Only Denmark and France scored lower on that measure - but both countries showed significantly stronger neighbourhood ties than the UK. The pattern emerges from a comparison of results from the UK’s so-called “happiness” index and similar studies across Europe measuring aspects of people’s “wellbeing”. Britain fares well in comparison with its European neighbours on several economic measures as well as having safer streets and better general health, at least on some measures, than many neighbouring countries. It scores poorly on a number of environmental measures, although is now in the top third of the EU league table for recycling. Overall people in the UK rate their general satisfaction with life more highly than average, with 71.8 per cent of the population scoring it at seven or more out of 10, putting the UK 11th in the EU. Just over eight out of 10 people in Britain (81.9 per cent) feel their life is generally “worthwhile”, putting Britain above the EU average of 78.5 per cent. In Greece, which was devastated by the financial crisis, less than half the population (47.8 per cent) believe their life is worthwhile. But Spain, in which youth unemployment reached almost 58 per cent earlier this year, had one of the highest levels of life satisfaction in Europe, ranked eighth out of the 28 countries. Significantly Spain also had the fifth highest score for neighbourliness, with 78.2 per cent of Spaniards saying they feel close to those around them. By comparison, only 58.4 per cent of Britons said they know people in their community well. Cyprus topped the European neighbourliness league, just ahead of Romania and Croatia. Ireland was ranked 14th, with a score well above the EU average. Meanwhile 88.7 per cent of people in the UK said they had a spouse, close friend or relative on whom they could rely for support and advice about a serious personal or family matter - putting the UK third from bottom. In Slovakia, almost everyone (98.8 per cent) said they had someone to whom they could turn. Christian Guy, director of the Centre for Social Justice think-tank, said: “It is ironic in a sense because we are becoming ever more connected in the way that we can communicate. “Different forms of technology mean that we may feel close to a lot of people but how superficial is the new social order we are creating for ourselves? He added: “There is something British about wanting to deal with problems yourself. “There is sense that perhaps we internalise things a bit more, and men in particular think less about taking problems and crises to others and try to take it all upon themselves. Meanwhile Britain was ranked 19th out of 28 for people’s satisfaction with their social life but eighth for cultural engagement. Despite having around three more years of “healthy life” than the European average, only just over six out of 10 Britons reported having good health, putting the UK 19th in Europe. Britons are more prone to social isolation than other Europeans, and researchers say the cost for society in lost productivity and poor health is rising. A new minister of loneliness is tasked with finding solutions. Frank Buckley, a widowed retiree, puts the kettle on after spending his second day this week doing woodwork in an old converted barn with a group of other men. His group of amateur carpenters are part of a national initiative for socially isolated Britons called – what else? – The Men’s Shed project that has opened more than 400 communal sheds for men who have retired or are unable to work due to disability or unemployment. “It’s good because a few men get together, have a cup of tea and help each other with bits and pieces using the wood lathe and other tools,” says Mr. Buckley. The Men’s Shed is just one way that Britons are trying to tackle the growing problem of loneliness in a country where nine million people are either always or often lonely, according to a 2017 study by The Co-op and the British Red Cross. Britain has been dubbed Europe's loneliness capital: Britons are less likely to know their neighbors than residents anywhere else in Europe, and a high proportion of the population says they have no one to rely on in a crisis. These fraying social bonds, and the health risks associated with them, led the British government to appoint last month its first-ever minister for loneliness. The new minister, Conservative MP Tracey Crouch, will work with businesses and charities to draw up a government strategy to tackle the problem. The ministerial post was one of the recommendations of a parliamentary commission that published its findings in December. Rachel Reeves, an opposition lawmaker who co-chaired the commission, called loneliness in Britain a social epidemic. “When the culture and the communities that once connected us to one another disappear, we can be left feeling abandoned and cut off from society,” she said in a speech to announce the report. That’s how it felt for Buckley, now 69, when his wife fell sick. In her final years, he was her sole care-giver; the couple had no children and their relatives live elsewhere. He was also struggling to adjust to retirement after losing his last job as a driver for a patient transfer service and not being able to find further work in this corner of rural Shropshire, bracketed between Wales and the industrial Midlands. “I didn’t enjoy being unemployed. You just spend time sitting and doing nothing and you become morose,” he says. His wife encouraged him to join the woodworking group and he found that it helped, particularly after she passed in 2016 and he was home alone. “When I lost my wife, I started going to the shed twice a week as I wanted something to occupy my time so I wasn’t just sat on my own at home. There are a couple of other people now in the same kind of situation who are bereaved and it does help to share that,” he says. The group also does volunteer work in the community and Buckley belongs to a social club that meets for Sunday lunch. The problem of social isolation is more than individuals simply feeling lonely – research shows that loneliness can have detrimental effects on both mental and physical health. One study by Age UK found that nearly a third of older men who have health problems are lonely. While chronic loneliness may not have caused their health problems, other studies have found it is as dangerous as smoking 15 cigarettes a day, as bad for you as obesity, and can increase the likelihood of an early death by 26 percent. Britain’s economy is also feeling the pinch. A study published last year found that social isolation could cost the British economy £32 billion ($44 billion) annually. The research, commissioned by the Eden Project, based its estimate on the cost of additional health and welfare spending and of an overall loss of economic productivity in disconnected communities. So why is the problem so much greater in the UK compared to its European peers? Edward Davies, the head of policy for the Centre for Social Justice, a right-leaning think tank, says there are many theories. One starts with the breakdown of the nuclear family in modern Britain, where 42 percent of marriages now end in divorce and where more people are choosing to remain single. “Historically more people were in pairs, and grandparents would live with their adult children rather than living alone. There has been a big shift away from that in just a couple of generations and we haven’t quite confronted it as a society,” he says. Another factor cited by Mr. Davies and other researchers is that British society is becoming more individualistic. Recent figures show that only 13 percent – just 2.6 million workers – are members of a union, down from nearly one in two workers in 1979. A recent surge of new members in the opposition Labour Party belies a steady, decades-long decline in British political-party membership. “There seems to be a wider disinterest in being part of something bigger but it means when life gets tough, you don’t have those structures to fall back on,” says Davies. Prime Minister Theresa May’s decision to appoint a minister of loneliness won her a rare burst of cross-party praise and a brief respite from heated Brexit-related politicking. The parliamentary fact-finding that led to the ministerial post was itself a reminder of that political heat: Its official name is the Jo Cox Commission on Loneliness. Ms. Cox, a Labour MP, formed the commission in 2016 before she was murdered by a right-wing extremist in the run-up to the Brexit referendum.